So my friend’s wedding was near the end of June. I have been helping her out some for it. She requested that I wear something in the colors of her wedding and that it be something I would be able to wear everyday not a special occasion. I wasn’t certain what I should make until I came across this cotton shirting on Fabric-Mart’s website. The first pattern that came to mind was Deer & Doe’s Reglisse dress. (It was right after Pattern Review’s weekend and I had seen Deepika’s cute Reglisse dress.) I knew it would be a perfect combo for the wedding. I really didn’t have time to make a muslin to double-check size. So erring on the hope it is enough, I traced out a 44 in the bust and graded to 46 in the waist. I have made Deer & Doe’s Airelle blouse before and knew that I used a smaller seam allowance for a better fit with the size 42 at the bust. The fabric was only 45 inches wide, so I changed the two piece circle skirt to four piece circle skirt. Since the fabric is a nice weight Japanese cotton shirting, I did skip interfacing on the tie collar. I was concerned that the tie collar would end up being too heavy with the interfacing and would not roll. As Deepika suggested, I went over to The Little Tailoress’ blog and looked at her construction changes to the pattern. I did use some of the suggestions just not all the hand sewing. For future uses of the pattern, I will have to lower the bust dart at least an inch. I think that also caused some of the awkward flatness in front. I did also have the Bruyere top traced out. So a quick comparison of the two front bodice pieces, show that the bust darts on the Bruyere are lower than the Reglisse (just lining up the under arm on each piece). I am not sure if Reglisse is just a special case or if I would have to do this on all Deer & Doe patterns. 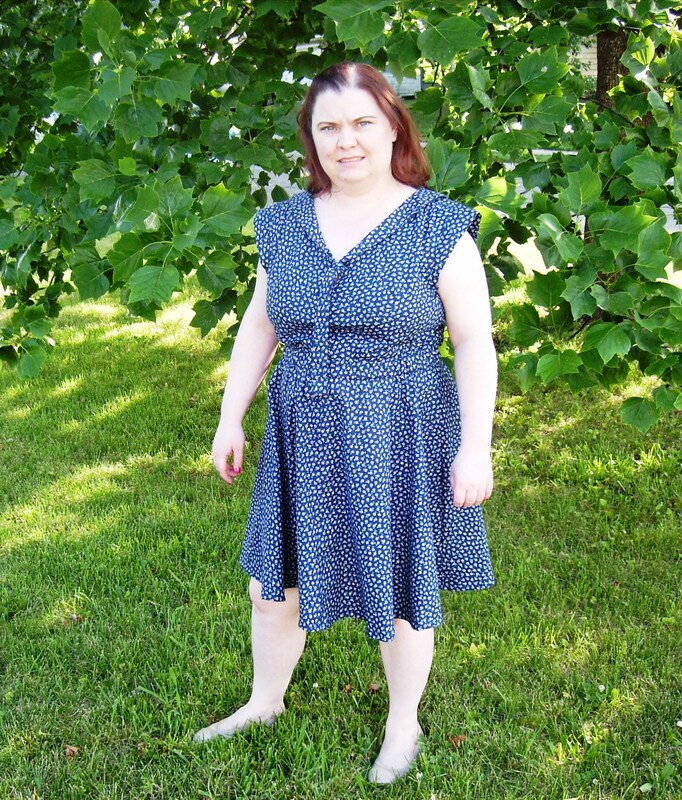 I just saw over on Deer & Doe’s blog that the Reglisse dress is up next on being updated. Pattern Review Weekend included a panel of independent pattern designers. At the weekend, I did purchase the famous Jalie Eleonore jeans. But after the weekend, I went on their website and purchased a top pattern. I had not used Jalie patterns before so I wanted something that I knew I would be able to complete before tackling jeans. All my measurements were a size Z. I did take a waist measurement on the pattern just to make sure there wasn’t too much negative ease at the waist. I can’t remember what I measured out for the size Z waist line. It was definitely not under my waist measurement otherwise, I would have graded the pattern out at the waist. My personal preference on knit tops is zero negative ease. Since it has been so hot lately, I decide on the sleeveless in View B.
I used a navy rayon jersey that I had in stash (which will be also used in a future t-shirt project). It worked very well for the top and gives enough drape for the tie collar. The construction was very easy. I think I had a top in three hours at most. For future makes of the sleeveless, I want to raise the under arm about a half-inch maybe less. Just because I haven’t used Jalie before, I would probably use the plain size Z without any under arm alterations for a make with sleeves before settling on any alterations for the views with sleeves.